HP is the world's most successful laptop brand and provides a range of consumer and corporate machines at varying price points. Its Pavilion dv6- 2105ea is designed for home entertainment use. Performance is stunning, thanks to Intel's cutting-edge Core i5 processor technology. As much as doubling the power of some of its rivals, this is by far one of the most powerful laptops you can buy at this price. This level of power is continued on the graphics side. 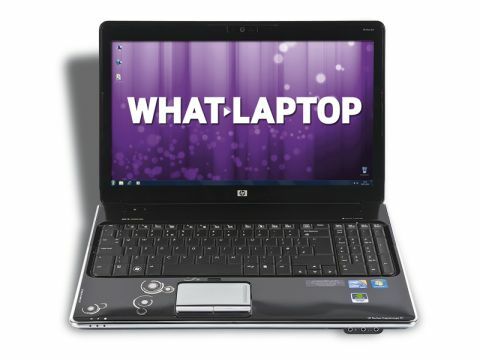 While the dedicated Nvidia graphics card is bettered by the Packard Bell EasyNote LJ75's ATi chip, there is ample power on offer for basic home entertainment use, including photo and video editing, and even regular mid-level gaming. The 15.6-inch Super-TFT screen adds to the multimedia usability, thanks to its widescreen aspect ratio. This extra width is ideal for watching movies and viewing multiple windows side by side. Image quality is strong, with impressive brightness, colour and contrast on offer. While there is no Blu-ray drive in place, the integrated DVD rewriter lets you enjoy and create standard DVDs and CDs. The drive also includes LightScribe functionality for cleanly and stylishly labelling your music and video discs. Unfortunately, where the HP is slightly flawed is its user interface. While the keyboard is wide and features a dedicated numeric keypad, the spacebar is not nearly responsive enough, requiring a very hard tap to successfully register. This makes touch typing almost impossible. Build quality is far more pleasing, with resilient plastics used throughout. The patterned finish may not suit all tastes, but adds a subtle style. All panels are firmly fixed, with no noticeable flex, making for a very tough overall finish. Weighing 2.8kg, this is not a machine that you'll want to carry on a regular basis. The 227-minute battery life is impressive for such a powerful machine, however, so you can easily work around the home or on short journeys when required. A nice touch is the excellent software package. Market-leading tools for internet security, CD/DVD playback and creation and basic office use are included, so you can get straight to work with this laptop without buying extra software. Despite its slightly flawed keyboard, the power and features of the Pavilion dv6-2105ea make it easy to like. If you mainly plan to use your laptop for home entertainment, then it's well worth a look, but be sure to keep the keyboard in mind if you plan to do a lot of typing.